So after the airgap install I also put on a new air cleaner (open top K&N 11x2) as I had to clear my new DUI distributor but even with the 2” tall it still hits bottom of the hood. See pic. 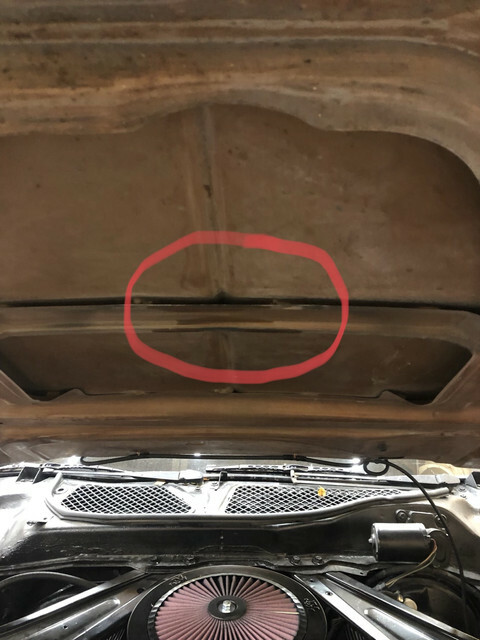 Can I cut some of this brace out without destroying the hood? I circled the area that would need to be cut back to clear. Only need about 1/4”. Yes you can but I wonder if you should. 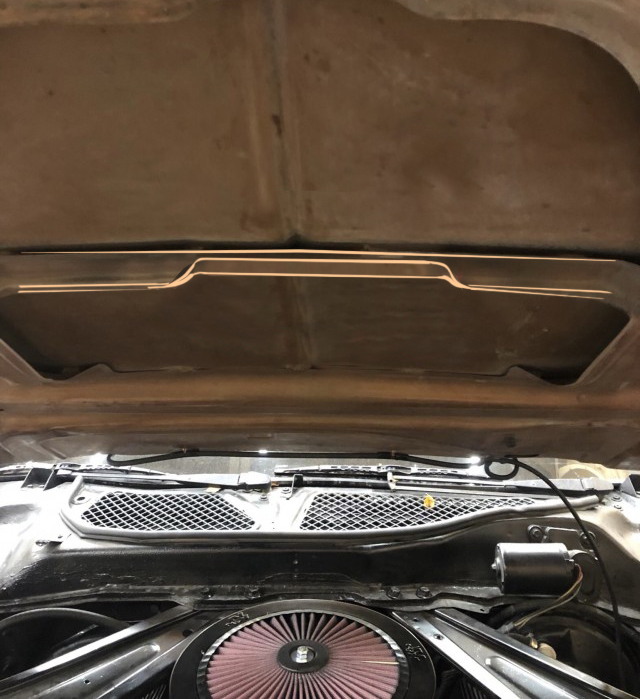 Mine has a flat hood too and I’ve had a round hole cut out above the filter so the air can actually enter through the 1969 Mach1 hood scoop I put on the hood. That of course meant cutting the brace and it held up nicely but every time I look at it I feel bad because I guess that brace was there for a reason. I certainly would not do it if you don’t have a scoop on the hood to cover things up as you may risk seeing waves in the hood afterwards. You could weld some reinforcement frame before, like your red circle on the pict, bits wider than your air filter and then cut. I would not need to cut out entire structure. Just the front and back of that brace where it drops down. I know the majority of the rigidity comes from that shape though. Has no one else with a flat hood installed an airgap and run into this problem? I tried a drop base for the air cleaner but it wouldn't clear the float adjustment screws on my quick fuel carb. (11-13-2018, 12:02 AM)luxstang Wrote: Yes you can but I wonder if you should. Do you have a pic of the underside of your hood? Yes but not on this device. I’ll look for it in the next days. Thanks. I like the look of your scoop and got to thinking if I have to make some mods to clearance to hood maybe just install a scoop while I am at it. I use a drop base. Where it would interfere with the float adjustment screws I just dimpled the base for clearance. Much better than cutting your hood. I've thought about adding a little clearance on mine, too. I have a Shelby (Blue Thunder) intake and a 1" spacer under the carburetor and the nut on my air cleaner just barely touches the brace. Three possible solutions, notch the brace, hood scoop (which will require running the braces around the scoop), or a NASA hood, sans ram air.